The beautiful community of Sanctuary at Wild Wing Plantation consists of single family homes and is located in the city of Conway, South Carolina. You will find all of the homes in this small community situated on Sanctuary Blvd. 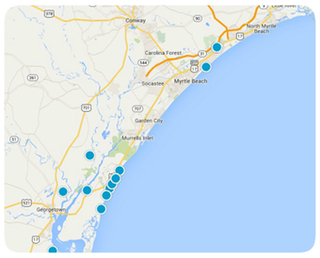 Residents love that they are only 10 miles from the beach and 2 miles from Coastal Carolina University. You will also have quick and easy access to Highway 501 which makes it easy to commute to other areas. All of the homes are ranch style and custom built to your liking. Part of the homes are located on the Wild Wing Golf Course, while the others are located in a beautiful wooded area. The typical home here is 3 bedrooms and 2 bathrooms with 2 car garages. There are many areas for residents to enjoy shopping, dining, entertainment, nightlife, golf, and outdoor recreation. Residents are also close to all of the amazing attractions that are located in the Myrtle Beach areas. Feel free to take a look at the beautiful homes we have available and let us know if you have any questions or interest in any of our homes.